One of my favorite foods in Singapore is nasi lemak. Many food stalls sell it in banana leaves wrapped into a cone shape. Cut open the raffia tie and the aroma of coconut and pandan escapes. Inside, you will find a mound of fragrant rice, slices of cucumber, fried anchovies and peanuts, a thick and spicy sambal (sauce) and half a boiled egg. The stall near my home includes a crisp fried fish as well. 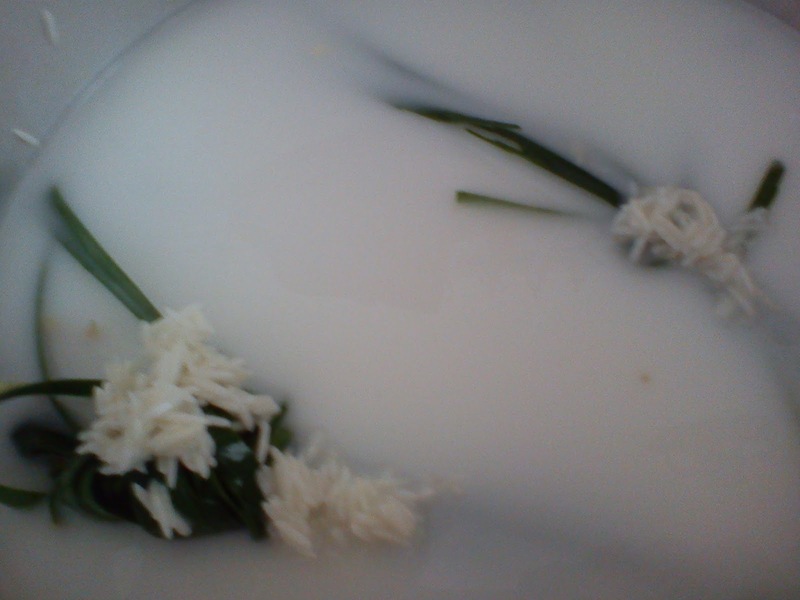 Coconut milk rice is pretty simple to make, though for an authentic taste, you need to use pandan leaves. 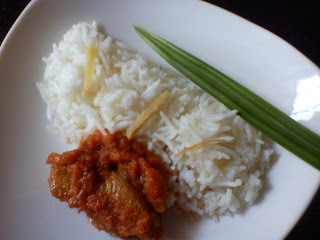 Coconut milk adds richness to the rice, I prefer to use thin coconut milk. Wash and soak the rice for about 30 minutes. In the meantime, julienne the garlic and ginger. Wash the pandan leaves under running water then run a fork through them. 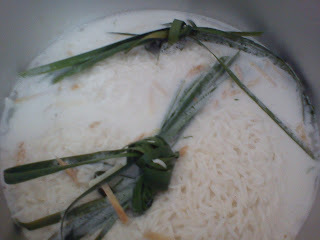 Tie the shredded leaves into a bundle. Drain off the water from the rice and put it into the rice cooker along with the pandan leaves, garlic and ginger strips. Mix coconut milk and enough water to make a litre of liquid. Pour it over the rice. Add salt to taste, stir well and switch on the cooker. After the rice is cooked, allow it to sit undisturbed for about 15 minutes. 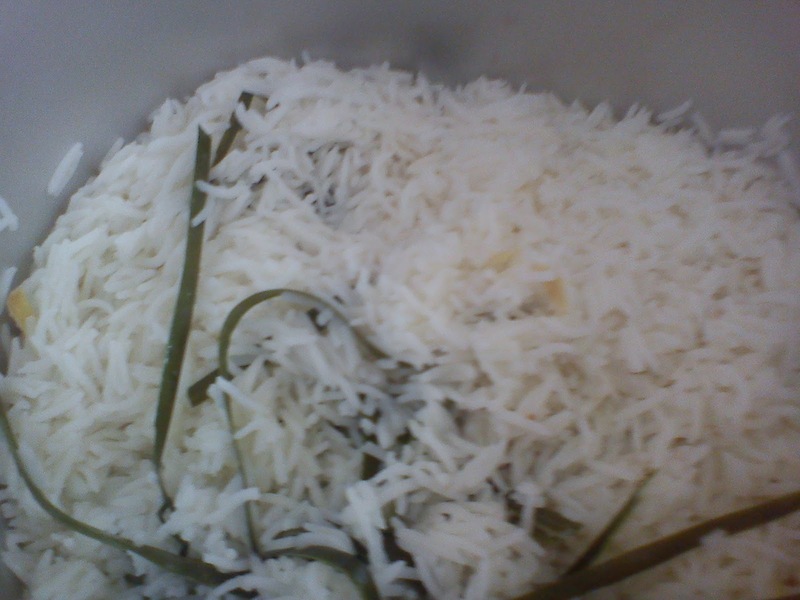 Fluff up the rice, discard the pandan leaves and plate up. 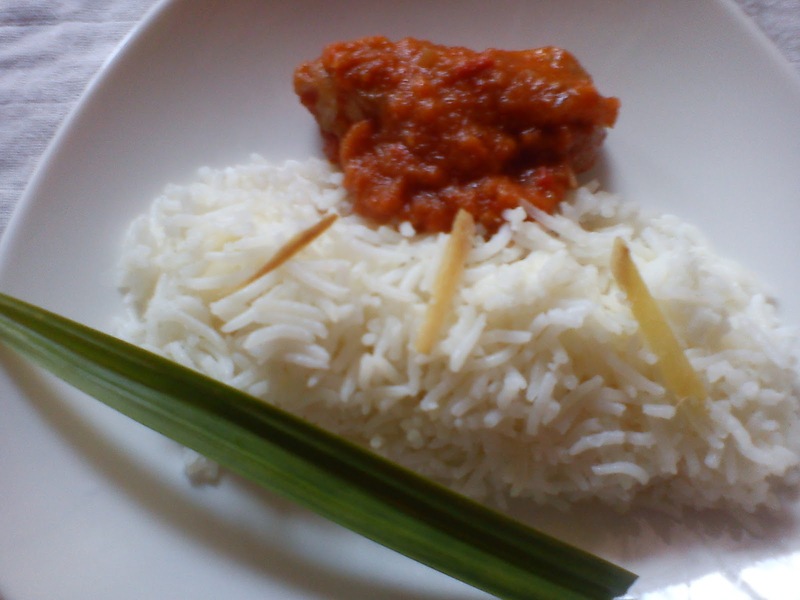 I served this with fish sambal. This is the same recipe as the prawn sambal, except that I made it with 750 grams of king fish fillets instead of prawns. Marinate the fish with 1/2 teaspoon chilli powder, 1/4 teaspoon turmeric powder and 1/4 teaspoon salt for about half an hour. Shallow fry the slices in 1/4 cup of oil, drain them well and then carry on with the rest of the recipe.